A savory slow cooker garlic sweet potatoes recipe that’s the perfect addition to your turkey dinner – let your slow cooker help you out in the kitchen this Thanksgiving! 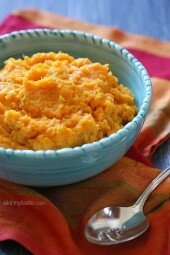 I’ve adapted my sweet potato mashed potato recipe for the slow cooker, as another option for you this Thanksgiving Day. The slow cooker is a great appliance to use on those days you have a lot to cook, and not enough room on your stove and this sweet potato recipe couldn’t be easier to adapt for the slow cooker. I’ve also done this with maple, I just skipped the garlic and added 1 1/2 tsp pure maple syrup instead for a sweeter version. Enjoy! These savory slow cooker garlic sweet potatoes are the perfect addition to your turkey dinner – let your slow cooker help you out in the kitchen this Thanksgiving! 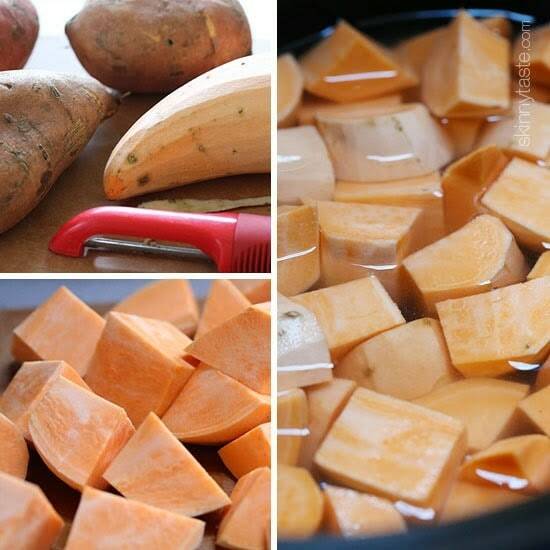 Place the sweet potatoes in the slow cooker and add just enough water to cover them. Add salt to the water, then cover and set the slow cooker to 4 hours on LOW. Just before the potatoes are ready, melt the butter in a small saute pan and sauté garlic until lightly golden. Drain the potatoes in a colander and return them to the slow cooker. Pour the garlic butter over them, add milk and sour cream and mash until smooth and creamy. Adjust salt and pepper to taste and keep the slow cooker set to warm until ready to eat or up to 2 hours. So, I just typed this recipe into the WW app so that I could make some changes, such as lactose free milk and possibly using Greek non-fat yogurt. I entered it at 1/2 the recipe as I only need 2 servings. At 1 lb potatoes, 1/2 tbsp of butter, etc. it came up as 9 points per serving, not 5. If I said half your recipe feeds 4, then I got 5 pts. Any ideas on why you’re so off? I hope I don’t find more of that – your recipes are so good. Not the best recipe. Left the potatoes in the crockpot for 4 hours on low, as instructed, but they were still hard as a rock. Needless to say we will not be having these for Thanksgiving! Haha. Sorry, not sure what went wrong? I've cooked sweet potatoes/yams in the crockpot recently and they came out just lovely~ I didn't add any water or even peel them until after cooked. I just scrubbed them and tossed them in! Easy peasy! Will be trying these out for sure~ SOON! 😀 Thanks so much, Gina! Here's an article that clearly points out the difference. This recipe used sweet potatoes, not yams. 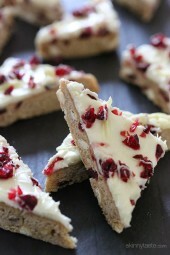 I really wanted to like this recipe, as I am having 20 for Christmas dinner and I was hoping for one hands off dish. Unfortunately, this won't be it. Even after 5 hours of cooking on Low, I was still leftt with undercooked chunks of potato. My family likes very creamy mashed potatoes and this recipe couldn't get to the consistency we desired. It was also very bland and took a lot of work to get the flavors right so I could get my family even to eat some of the potatoes. I am glad I tried this out before Christmas. Gina, I love your site and many of your recipes are staples in my house, unfortunately this isn't one of them. I had the same result. I had to cook the potatoes for 2 hours longer than suggested. I also found the end result to be quite bland and it felt like too much liquid was added. I am also a huge fan of this site but not this recipe. We also unfortunately had the same result. It cooked most of the day and still had many undercooked chunks. Agree on the bland part, too. I love most of these recipes so much, I hate saying anything bad, but I will stick to the classic yams for now. Same thing here, and we kept cooking them (for 8 hours!) in very small chunks. Just couldn’t get them blended smoothly, even after adding some cream to try to smooth them out. Usually I’m a “savory” type person, and thought I would love the garlic in these, but it turns out I think I much prefer the standard way of sweetening these with a touch of brown sugar and butter, especially on Thanksgiving. I love almost every recipe on this site, but this one didn’t do it for us. Just crawled out of bed at 6:15 Thanksgiving morning to finish these. So yummy! Gina, if I were to double the recipe.. How long should I cook on low? Still four hours or double the time as well? Can you susbtitute the sour cream with something else? I can't do dairy products. Any suggestions? Gina, If you were to replace the garlic with maple syrup, how much syrup would you use? Hi Gina! How would you go about making this vegan-friendly? Well you could ruin the dish with coconut oil or flax seed oil or olive oil or some combination of them. Or you could man up and use butter, the way God and Jesus intended. Thanksgiving is Jesus' birthday, after all. Made these the other night, halved the recipe and still had leftovers (only two of us). So the next day, I added egg and some bread crumbs, and made sweet potato pancakes out of the leftovers. 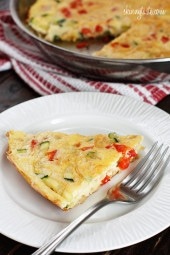 Sure was yummy along with scrambled eggs! Thanks for the wonderful recipe! Do you add the maple syrup at the beginning (when you first out the sweet potatoes in the slow cooker) or at the end (when you would put in the garlic)? thanks! I love this website!!! i dont see in the directions or ingredients where maple syrup is… am i blind? The maple is for a different version. I wonder if I could go half and half between russet and sweet potatoes for a lighter version? I am the only one in my family that likes sweet potatoes, maybe I could get them to eat it this way! My sweet potatoes are orange and always look like that. My guess is that she is using yams – sweet potatoes are not that easily found, at least where I live. Just want to confirm that you are using sweet potatoes and not YAMS. in some pics they look orange like yams. 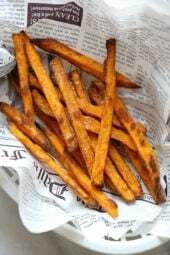 In restaurants or when you buy frozen "Sweet Potato Fries" they are serving you YAMS not sweet potatoes (which are creamy yellow inside) not orange. please confirm as they both have very different flavours, especially adding garlic to them. Thanks Gina….i'm a skinny fan! They were labeled sweet potatoes in the store so I can only assume they were sweet potatoes! Your pictures are definitely too Orange to be sweet potatoes and in all likelihood are YAMS, but the orange sweet potatoes would work too. I agree with the commenter that the flavor profile and texture is very differennt between yams and sweet potatoes. 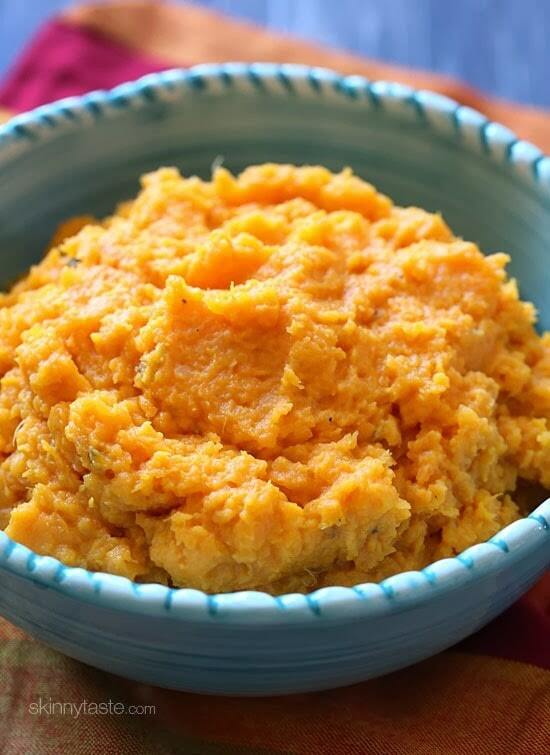 (yams are gummier and stronger flavored, sweet potatoes are more like potatoes, lighter and subtle….I personally prefer the stronger flavor of the yams and the bright orange color provided in this recipe. What size slow cooker did you use for this? I have a 5 quart. I think it would work fine, I do that with my regular mashed potatoes. When making sweet potatoes, I always boil them in their skins until tender, cool on a rack and the skins come right off. Then you have your potatoes ready for mashing. PS – you can do this a day or so in advance also – big time saver! You can keep almost anything warm in the crockpot!!! I would love to know if this can be made with regular potatoes also. I LOVE this site, Gina! You are a God-send!!! Can I do this with regular potatoes? I just love sweet potatoes and this idea of making mashed sweet potatoes in a slow cooker! Thanks for sharing! Do you think this would work with russet potatoes? Would love to free some space on my stove on Thanksgiving! Sure, regular mashed potatoes come out fine in the slow cooker! What a great idea! Quick Q — can I substitute Greek yogurt for the sour cream (I hate to buy a whole tub of sour cream for just 2 T)? I don't want it to curdle. Thanks for another home run! Yogurt tends to curdle when it's low fat. This is beyond brilliant! I love the idea of a slow cooker mashed potato – super easy and perfect for keeping warm while buzzing around the kitchen for Thanksgiving. Thanks, Gina! 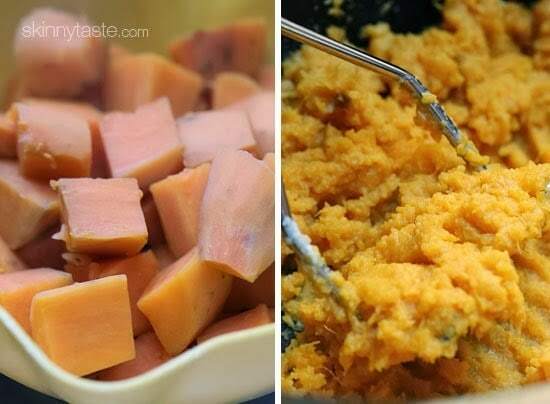 I have never made sweet potatoes before and this looks like the perfect recipe to try out! Thanks!